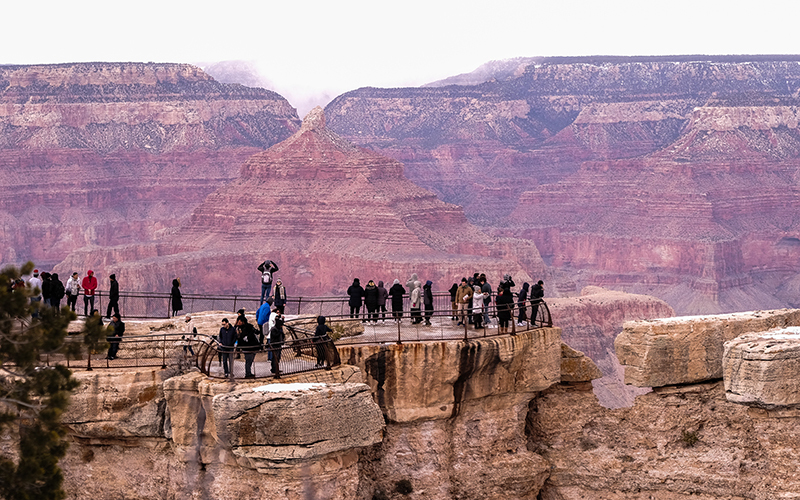 GRAND CANYON – Waiting for the sun to rise, visitors to Grand Canyon National Park quietly stood at Mather Point. By 7:45, sunbeams pierced the low clouds to illuminate the red rocks and the sparkling snow. Despite the partial federal government shutdown, which ended Jan. 25, for most visitors, the closure didn’t affect their experience. Although Petrified Forest National Park closed during the longest government shutdown in U.S. history, Arizona’s two other national parks – Grand Canyon and Saguaro National Park – remained open with limited services. The visitor center at Grand Canyon was closed, but the Grand Canyon Conservancy bookstore, hotels and restaurants were open. It was a similar story at Saguaro. But as of Monday, both parks were fully staffed, and it was business as usual, at least for the next three weeks while the debate over funding a southern-border wall continues in Washington, D.C.
Park officials say Saguaro and Grand Canyon are recovering from the shutdown with limited damage, and they are prepared should another shutdown happen. 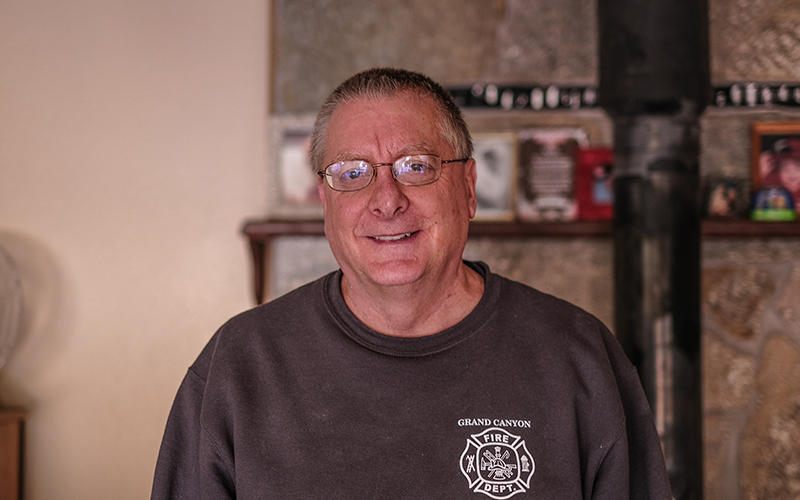 Robert “Bob” Beaver, 62, is pastor at the Grand Canyon Community Church in the village where National Park Service workers, concessionaires and other canyon employees live on the South Rim; he also works for the fire and security department in the canyon. Beaver said the five-week long shutdown brought the community together through a food bank and assistance program for furloughed workers. Robert Beaver is the pastor at the Grand Canyon Community Church in the village where National Park Service workers, concessionaires and other canyon employees live on the South Rim. He said the five-week shutdown brought the community together through a food bank and assistance program for furloughed workers. The food bank, located in the residential recreation center, was restocked almost every day by St. Mary’s Food Bank in Flagstaff, according to employees. Beaver said the government workers, concessionaires and other canyon staff love being at the Grand Canyon and have always taken good care of it. Unlike Joshua Tree National Park in California, where visitors vandalized trees and trash was left to pile up, Grand Canyon and Saguaro National Park didn’t have major issues with trash or destruction. Grand Canyon, a major economic driver in Arizona, had extra help from Gov. Doug Ducey, who last year issued an executive order to create the Grand Canyon Protection Plan. 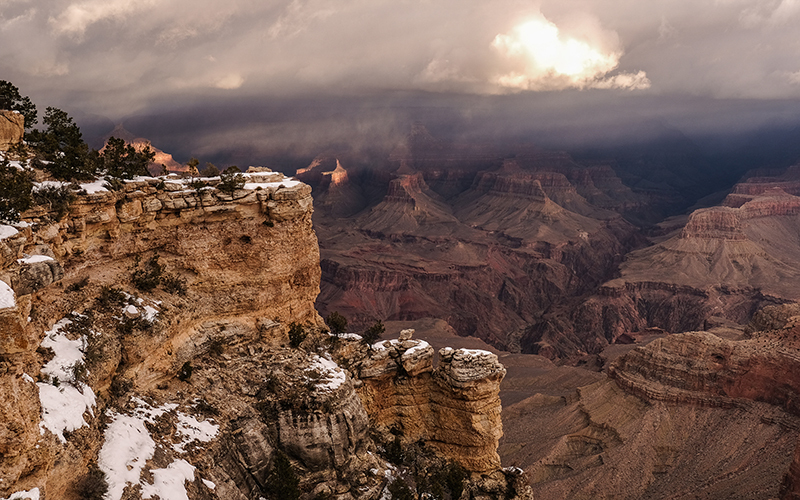 The plan established what to do in case of a government shutdown, and how money transfers from the state to the U.S. Department of the Interior to fund necessary operations at Grand Canyon National Park, which in 2017 saw more than 6.2 million visitors from around the world and generated more than $666 million in revenue, park spokeswoman Emily Davis said. This was the first time Ducey’s plan was used to keep Grand Canyon open. The state spent $193,151.28 before the National Park Service issued a statement Jan. 6 that parks could use revenue funds to provide such services as trash pickup and waste disposal. Saguaro National Park, near Tucson, also remained partly open during the shutdown. Roads and trails were accessible, according to a press release, but all visitor services were closed and there were limited emergency and rescue services. The park canceled all community events, including the annual Holiday Caravan program, scheduled from Dec. 22 through Jan. 25. The park did not have state funds to maintain trash and waste disposal, so community members stepped up, said Andy Fisher, chief of interpretation and public information officer for the park. “We worked really hard here in Tucson to be a part of this community and to support this community and have felt very supported in return,” Fisher said. Part of that help came through Friends of Saguaro National Park – a nonprofit fundraising partner of the National Park Service. Fred Stula, executive director of the group, said they began picking up trash the day after Christmas. Stula said he initially had three volunteers, but after stories about vandalism in Joshua Tree National Park went viral, the number of volunteers jumped up. With a Facebook post, about 30 volunteers pitched in to keep the park clean. Stula estimated he and his volunteers collected about 20 trash bags per week. At Grand Canyon, it was a similar story. Park officials and visitors say the trails were clean and most visitors seemed to follow the rules, aside from some snowy footprints near the edge were visitors ignored the railings at Mather Point. Davis said that with the help of employees in retail stores and restaurants, safety and other basic information were maintained for visitors to help them understand the importance of the park. Congress has until Feb. 15 to negotiate a Department of Homeland Security budget that would include funding for border security. President Donald Trump has said if a deal isn’t reached by then, he will either close the government again or declare a national emergency to build a wall, which has been a key promise of his presidency.